It’s was only Wednesday, just the 3rd day of Fox “News” Channel’s newest “news” show “Fox and Friends First.” Yet at the end of today’s hour Blonde #1 and Blonde #2 announced they are being rotated out already, in favor of two of the word-pitchers warming up in the bullpen. While it’s a surprise they’d pull the hosts after just the third inning, it was always intended that a series of hosts would rotate through the 5AM hour. Starting tomorrow Dave Briggs, of the “Fox and Friends Weekend” B-team, and Heather Childers will be manning the leg chairs. @averageamericanpatriot. As someone else once observed, we don’t know what Retchin is always desperately trying to show us up her skirt, but we bet it has sharp teeth. 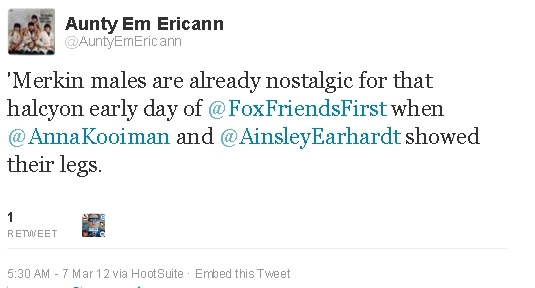 The Fox “News” suits are sexist pigs. They use these women to draw middle-age men to the shows. Let’s see the men’s legs. These Fox “News” broads dress like showgirls at a Las Vegas nightclub. All you need is a pole. Nixon-trainee Roger Ailes has no respect for women. And given what we know about him, we are not surprised. It’s just like the 700Club. I’m blockin’ that one right now. Terrorists Hate Us for Our Legs!!! I really have to admit that I admire your dedication to your craft. If I had to get up at 5:00 every morning and start my day with Fox News I’m pretty sure day 3 and 4 would go something like this. 5:00 Bob gets up and turns on the TV. 5:15 Neighbors call police and report sound of gunfire. 11:00 LDS Church members don enchanted jockstraps. 11:15 Representative for Bob is dumped in swimming pool. It was like a double, double amputation. As Aunty Em tells it Blonde #1 and Blonde #2 lost their legs. Are you kidding? They were ALL leg! That was the problem!